It was recently posted on TwitPics by Julie Rico, who was kind enough to share it with me. 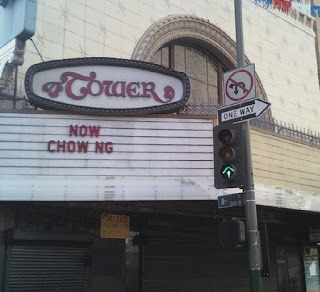 Julie says that the Tower Theater is located on the corner of 6th and Broadway, a major thorough way for Latino/a pedestrians and shoppers in downtown Los Angeles. So when in the area, be sure to stop by and chow down. And for that matter, please visit Julie Rico's Gallery...as well as Sally's Fun on Mars.